HSV Channel 7. June 30th, 1970. LP (OP) Columbia. SOEX-9666. 1970. 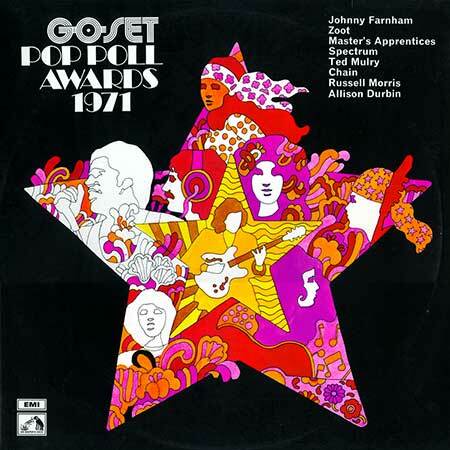 "GO-SET POP POLL AWARDS, 1970". Album compiled by Howard Gable. Recorded by Bill Armstrong Studios, Melbourne. Editing Engineer: Ern Rose. One. (Nilsson). v: Johnny Farnham. (Associated). 5:10 Man. (Ford - Keays). v: The Master's Apprentices. (Castle). Rachel. (Froggart). v: Russell Morris. (Morris). Don't Make Me Give In. (Young). v: Allison Durbin. (Morris). Mr. Songwriter. (R. Springfield). v: Zoot. (Castle). Lu. (Laura Nyro). v: Yvonne Barrett. (Albert). Golden Days. (Goffin - King). v: Allison Durbin. (Screen Gems). The Girl That I Love. (Young). v: Russell Morris. (Morris). About Time. (Cadd - Mudie). v: Zoot. (Leeds). Picture Me Gone. (Al Gorgoni - Chip Taylor). v: Yvonne Barrett. (April). Think About Tomorrow Today. (Ford - Keays). v: The Master's Apprentices. (Castle). Raindrops Keep Fallin' On My Head. (Bacharach - David). v: Johnny Farnham. (Belinda). LP (OP) Columbia. SOELP-9829. 1970. 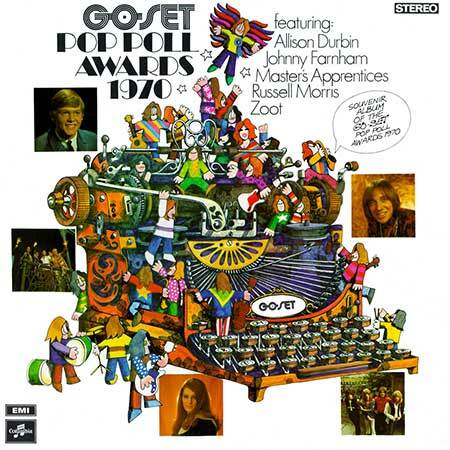 "GO-SET POP POLL AWARDS, 1971". Acapulco Sun. (Randazzo-Pike). v: Johnny Farnham. (World Artists). Eleanor Rigby. (Lennon-McCartney). v: Zoot. (Northern Songs). Because I Love You. (Ford-Keays). v: The Master's Apprentices. (Castle). Going Home. (Michael Rudd). v: Spectrum. (Cellar Music). Falling In Love Again. (Vanda-Young). v: Ted Mulry. (Albert). Black and Blue. (Chain). v: Chain. (Festival). Sweet, Sweet Love. (Morris). v: Russell Morris. (Morris Melodies). I'm Your Satisfier. (Ford-Keays). v: The Master's Apprentices. (Castle). I'll Be Gone. (Michael Rudd). v: Sprectrum. (Cellar Music). Evil Child. (Rick Springfield). v: Zoot. (Castle). Put Your Hand In The Hand. (Gene MacLellan). v: Allison Durbin. (Castle). As Long As Life Goes On. (Bob Young-Ted Ottley). v: Johnny Farnham. (Quaver Music).